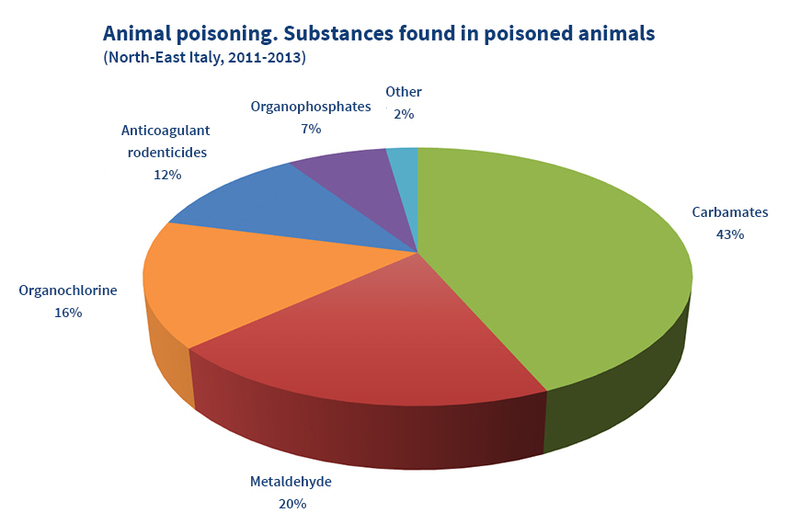 Domestic and wild animal poisoning continues to occur in the Triveneto region, despite the problem being addressed by the local authorities and the issue of orders banning the use and possession of poisoned baits and food morsels. 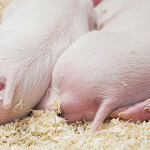 Besides being a danger for animal health, the poison can spread to the environment, polluting the land and surface waters, or come directly into contact with people, especially children, exposing them to serious health risks. 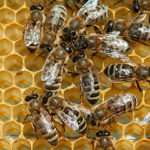 The number of suspect samples referred to the Istituto Zooprofilattico Sperimentale delle Venezie has increased significantly, even after the entry into force of the first ministerial order at the end of 2008. 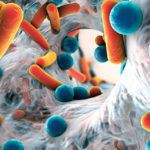 Over the three-year period 2011-2013, approximately 1,300 suspect samples have been submitted to IZSVe, 40% of which were positive on toxicological analysis. This demonstrates the need to strengthen monitoring and control efforts by health authorities and to raise citizen awareness. 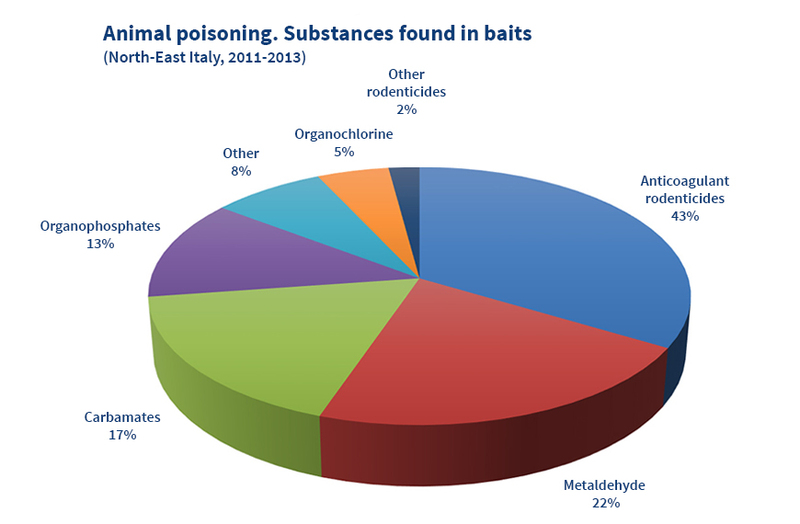 According to analyses conducted by IZSVe during the period 2011-2013, the substances most widely used to prepare baits were anticoagulant rodenticides, which together with metaldehyde and carbamates, accounted for approximately 75% of the substances used in baits. In cases of suspected animal poisoning, the use of anticoagulant rodenticides proved instead to be decidedly lower than in poisoned morsels. 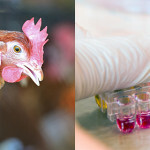 This is probably because animals poisoned by anticoagulant rodenticides can be cured if diagnosed and treated promptly with vitamin K.
During the three-year period 2011-2013, the SCS2 – Chemistry laboratory of IZSVe analysed samples from almost 1,300 suspect cases from the entire Triveneto region. Approximately 40% of these tested positive on toxicological analysis. Epidemiological maps describing trends in the phenomenon throughout the region were drawn up from relevant data recorded and evaluated on these samples. They show the distribution of cases of poisoning, the locations where poisoned baits were found, and the type of substances used in the various areas. 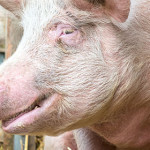 These data can provide citizens and veterinarians with useful information and indicate the areas where the problem has been most widespread in recent years. 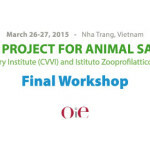 In addition, the authorities can glean important information to limit the spread of poisoning. 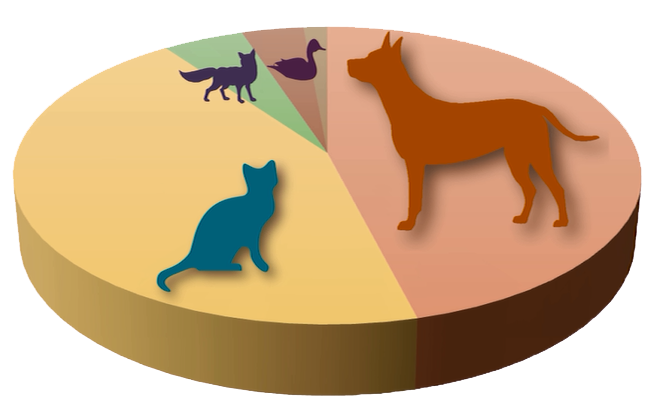 According to IZSVe records, the most affected species are cats and dogs, while less than 10% of cases involve other species as foxes or fowl. The number of cases of poisoning among wild animals is most likely underestimated because the carcasses are often not discovered.